While many of us in Southern Nevada want to travel this time of year, many of the go-to places are now too cold, or covered too deeply with snow, to enjoy much time outdoors. But you won’t have that problem if you head down into the Sonoran Desert and Tucson, Arizona. Almost as far south as you can go in Arizona, winter weather there is luxuriously pleasant. Deborah Wall If you are extremely fortunate you might see a cristate or crested saguaro, shown here. Very rare, only 25 have been found among the 1.5 million saguaros of Saguaro National Park. This cristate saguaro was found outside the park, just north of Wickenburg, Arizona. Deborah Wall The Arizona-Sonora Desert Museum is not only an arboretum but a world-class zoo. 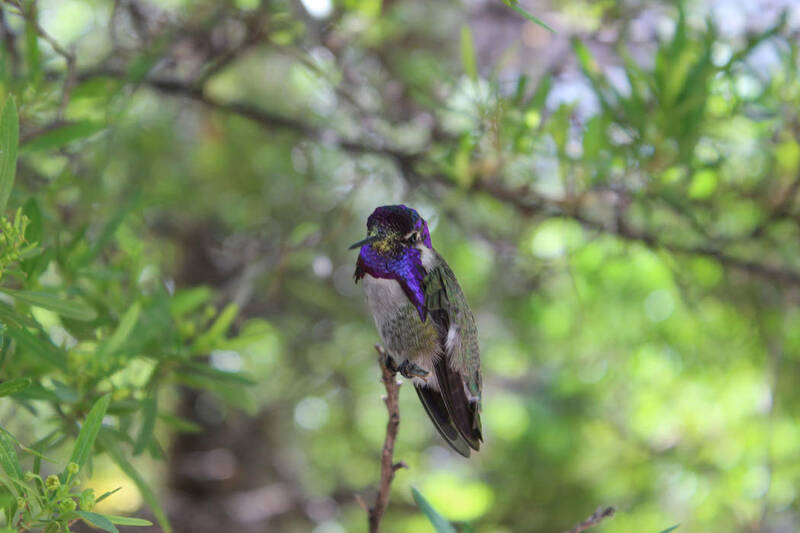 One popular place is the hummingbird aviary where it’s possible to see eight species of these flying jewels. The two highlights that outdoor lovers should not miss are Saguaro National Park and the Arizona-Sonoran Desert Museum. Just as the sprawling Joshua tree is a signature plant for our Mojave Desert, the towering saguaro cactus (Carnegiea gigantean) is the signature of the Sonoran Desert. In fact, many visitors from foreign nations, when they dream of visiting the American West depicted in films and cartoons, conjure up the iconic image of the saguaro. That’s to be expected, for saguaros are the largest cactus in the United States, with mature plants reaching 40 feet or more. Look at some of the smaller ones, perhaps 2 feet tall and ponder the fact they might be 30 years old. 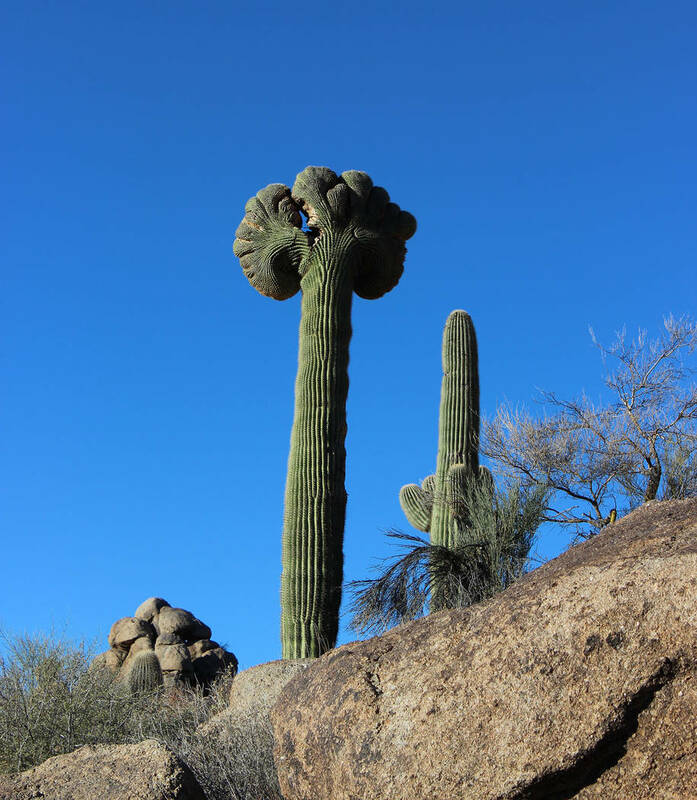 The first arms on a saguaro might not appear until the plant is 50 to 100 years old. The best place to see saguaros, agreeably growing in high numbers, is Saguaro National Park. There are more than 1.5 million of them here. This park is split into two districts: the Tucson Mountain District lies west of Tucson and the Rincon District to the east. Both are worth seeing. I prefer the Rincon district and its trails, but it takes about 20 minutes longer to drive to it from the interstate. There are 165 miles of trails in the two districts, from easy strolls to multiday adventures where you can immerse yourself in the Sonoran Desert environment. You are welcome to walk into either district of the park 24 hours a day, but vehicles are allowed in the Tucson Mountain District only from sunrise to sunset and only 7 a.m. to sunset in the Rincon Mountain District. Contact www.nps.gov/sagu, or call 520-733-5153, for more information. If you are very fortunate while in the Sonoran Desert, you could possibly see a cristate or crested saguaro cactus. Experts don’t agree on what causes this rare form. Is this fan-shaped saguaro a genetic mutation, or the result of freezing or perhaps a lightning strike? But if you see one consider yourself lucky for only 25 have been found among more than a million in the park. The next logical place to visit would be the 98-acre Arizona-Sonora Desert Museum. It lies 14 miles west of the city, yet only 2 miles from Saguaro National Park West Visitors Center. This is primarily an outdoor museum where 85 percent of the exhibits lie along walking trails. Two miles of paths, gravel and paved, pass by more than 55,000 plants of 1,200 native species. The trails will take you to native habitats like the mountain woodland area and the desert grasslands. You can also consider this place a zoo for it is home to more than 200 native bats, other mammals, reptiles, amphibians, insects and birds. Currently, these include a mountain lion, black bear, Mexican gray wolves and Merriam turkeys. Be sure to keep an eye out for the javelina (collared peccary) on the half-mile Desert Loop Trail. I have found them hanging out on the west side of the loop under and near the bridge. One of my favorite exhibits was the hummingbird aviary. There are many species of the bird and some of them actually landed on my head, probably because I was wearing a red cap that must have looked, to a hummingbird, like a big, nectar-filled flower. Plan to allow at least two or three hours for a visit here, and a little more if you wear a red hat. The museum is open year-round, daily, with seasonal hours through February, from 8:30 a.m. to 5 p.m. For more information, visit www.desertmuseum.org or call 520-883-2702. From Boulder City, drive south on U.S. Highway 93 76 miles to Kingman, Arizona. Merge onto Interstate 40 E/U.S. 93 S and drive 22 miles. Merge onto U.S. 93 toward Phoenix. Drive 105 miles and take the exit for U.S. Highway 60 E. Drive 38 miles and merge onto Arizona Route 101 S/Loop 101 S/Agua Fria Freeway S. Travel 9 miles, then merge onto Interstate 10 E. Drive 124 miles to Tucson.